Reflections on SG: Local R&D — Are We Getting Adequate Return on Investment? Local R&D — Are We Getting Adequate Return on Investment? Member of Parliament Lim Wee Kiak recently asked the Prime Minister in Parliament (a) whether the National Research Foundation had achieved its objectives; (b) the number of patents filed in Singapore; and (c) the measures that would be implemented to increase Singapore's creativity and knowledge-based output. Deputy Prime Minister Teo Chee Hean (on behalf of the Prime Minister) gave the following reply (in bold italics). R&D efforts in Singapore have resulted in about 1,500 to 2000 patents being filed worldwide every year. Firstly, Dr Lim could easily have found this answer in Economic Survey of Singapore 2011. Secondly, the better question to ask is: what have been the number of patents awarded? 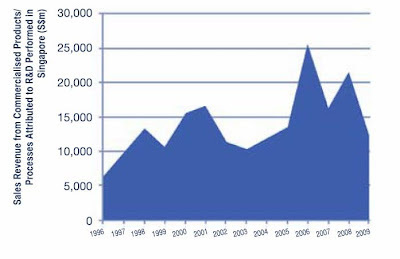 1,569 patents were filed in 2009, and 747 patents were awarded. 1,762 patents were filed in 2010, and 653 patents were awarded. 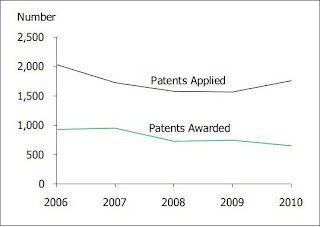 Although a patent may not necessarily be awarded in the same year that an application for a patent is filed, the gap between patents filed and patents awarded is persistent. The best measure of success of the R&D efforts is when research outcomes are coupled with innovation to translate into solutions with economic and social impact. Singapore has benefited from strategic R&D investments in areas such as biomedical sciences, clean water, and interactive and digital media. Singapore's biomedical sciences manufacturing output has more than tripled from $6.3 billion in 2000 to $23.3 billion in 2010 and created 14,000 jobs by the end of 2010. Investments in clean water technology have helped develop Singapore into a global hydro hub. The water sector's value-add expanded by $590 million and 2,300 jobs were created over the period 2006 to 2010. R&D supported a growing interactive and digital media sector where value-add expanded by 26 per cent from 2007 to 2010. Most people can agree that the best measure of success of the R&D efforts is when research outcomes are coupled with innovation to translate into solutions with economic and social impact. But how do the data provided by DPM Teo show the link between local R&D efforts and economic and social outcomes? DPM Teo had previously stated that the sales revenue from products of R&D performed in Singapore was $12.3 billion in 2009 [note 2]. How much of the $12.3 billion sales would not have taken place without local R&D? In any case, what matters more is value-added — instead of sales — from products of R&D performed in Singapore. Value-added is the commonly used measure of contribution to the overall economy. In Parliament last week, DPM Teo said that the biomedical manufacturing, clean water and interactive and digital media sectors had benefited from strategic R&D investments. To what extent was the value-added and employment of the biomedical manufacturing sector attributable to local R&D efforts? Investments in clean water technology may have helped to develop Singapore into a global hydro hub, but to what extent was the $590 million increase in the water sector's value-added and 2,300 jobs created attributable to local R&D efforts? R&D may have supported a growing interactive and digital media sector where value-add expanded by 26 per cent from 2007 to 2010, but to what extent was this attributable to local R&D efforts? The government is investing $16.1 billion from 2011 to 2015 to boost research, innovation and enterprise. This is a 20 per cent increase over the previous five years. Key thrusts under Research, Innovation and Enterprise 2015 include allocating a greater proportion of R&D to focus on economic outcomes, providing more support for commercialisation of R&D into products and services, and fostering R&D collaborations across disciplines and between the public and private sectors. R&D expenditure. Gross R&D expenditure in Singapore increased from $6,043 million in 2009 to $6,489 million in 2010. Private sector gross R&D expenditure in Singapore increased from $3,724 million in 2009 to $3,948 million in 2010. Public sector gross R&D expenditure increased from $2,318 million in 2009 to $2,541 million in 2010. The latter comprised R&D expenditure by institutions of higher education ($968 million), public research institutes ($901 million) and the government ($672 million). Gross R&D expenditure is part of GDP and accounted for 2.1 per cent of GDP in 2010. R&D manpower. The full-time equivalent number of researchers in Singapore rose by 4.9 per cent from 30,530 in 2009 to 32,031 in 2010. Singapore’s researcher intensity (i.e., the number of full-time equivalent number of researchers per 1,000 labour force) rose from 10.1 in 2009 to 10.2 in 2010. There were 28,296 research scientists and engineers (which number differs from that in the preceding paragraph because full-time postgraduate research students, who hold formal qualifications at the university degree level, are not included here) in 2010, of which 15,640 were in the private sector and 12,656 were in the public sector. It is one thing, and an easy one at that, for the Government to pour money and human resources into R&D. What have been the quantifiable economic benefits of having invested (or expended) $13.55 billion in R&D over the five-year period of the Research, Innovation and Enterprise 2010? What are the projected quantifiable economic benefits of investing (or expending) $16.1 billion in R&D over the current five-year period of the Research, Innovation and Enterprise 2015? These are huge sums of money that have been, and continue to be, spent. In comparison, the sum set aside for the GST Voucher Scheme for five years is $3.6 billion in total. When companies spend money on R&D, they watch their bottom lines diligently. When our Government spends money — our money — on R&D, what does it watch? Patents filed and patents awarded are nice, but what is the quantifiable actual or projected economic return (as the case may be) on state-funded R&D investment? How much of the resulting economic benefits has flowed back into state coffers? Does anyone really know? 1. MINISTRY OF TRADE AND INDUSTRY Economic Survey of Singapore 2011. 2. MINISTRY OF TRADE AND INDUSTRY Research, Innovation and Enterprise 2015.